I first met Dennis Wagner in 2014, when he and his father, Bro. Dale Wagner, were hunting with Ken Fernburg at Triple B Outfitters in Ohio. It was during that hunt when our friendship began as I was guiding him and his father. His father was a Past Master and spoke to him about the fraternity. Having been diagnosed with Leukemia, Dennis wanted to do something, not only for himself, but his father. During the Fall of 2015, Dennis joined Sunbury Lodge No. 22. The two of them spent countless hours doing degree work, including hours in their hunting camp. Dale wanted to teach Dennis the same way he had been taught when he received his degrees. On October 15, 2015 Dennis received his Master Mason degree – given his father. In January 2016, Dennis started going through the chairs as Junior Deacon. He became proficient in the Entered Apprentice Mason degree and was approved in June 2016; unfortunately his father never had the opportunity to see his son confer a degree, as Dale passed on May 6, 2016. As a Freemason, I am fortunate to know many of the District Deputy Grand Masters across our great Commonwealth. During the 2016 December Quarterly Communication, I was approached by Bro. Bud Baker, District Deputy Grand Master of the 46th Masonic District. Bro. Baker told me he had an interesting conversation with Dennis , and was wondering how the two of us knew one another. I told him the story of our hunting trip and that I was supposed to hunt with him in January 2017, in Ohio, during the late muzzleloader season. He told me that Dennis met all the requirements for the Master Builders Award. We decided it would be a great idea if I presented it to him in hunting camp, especially since his father was a true sportsman. I agreed and on January 9, 2017, we both harvested mature Ohio whitetails and I was honored to present him with the award. Bro. Dennis is an incredible person, with talents beyond expectation. He placed three times in the top 10 of the Turkey Calling Grand Nationals, is an extremely talented woodworker, as well as an accomplished artist. Dennis is what all Freemasons should aspire to be, a wonderful family man, respected in his community, and a true friend. 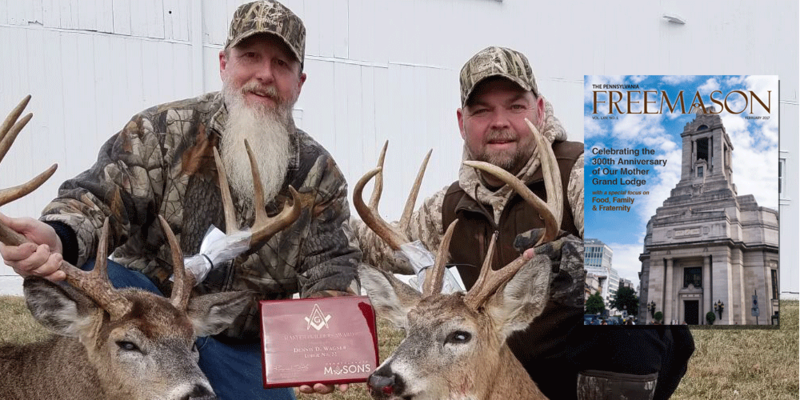 It was my honor to present a truly great Mason with the award, and I am looking forward to our next great hunt!